Darkest Hour is set in the early to mid-1940's during World War II. Nazi Germany's forces have made significant advances across Europe towards the Atlantic Ocean. The resignation of British Prime Minister Neville Chamberlain (Ronald Pickup) is being called for as he has not provided the authority in leadership that Great Britain needs in order to fend off Germany's impending invasion attempt. Chamberlain resigns, and Winston Churchill (Gary Oldman), who has a spotty political record but has proven to be correct in his beliefs that Adolf Hitler is a danger to everyone (and is the only candidate that both sides of Parliament are willing to accept). As the film plays out, Churchill goes through a learning curve in regards to running a country in a military conflict. He proves to be stubborn and very set in his ways. His largest obstacle is convincing those in Parliament that his unorthodox moves have the nation's best interests in mind. The move that takes the most convincing is his desire to re-route an infantry regiment from Calais to intercept and distract German forces so that a naval fleet (comprised mainly of civilian boats) can be sent in to evacuate Dunkirk. This is basically ordering a suicide mission, but Churchill believes that retreating with some of their forces intact is a better position than losing virtually all of their remaining forces by leaving the regiments in Calais and Dunkirk to fend off the Germans completely unaided. Similarly to the way 2006's Flags of our Fathers and Letters from Iwo Jima worked together, Darkest Hour is the perfect companion piece to Dunkirk (and why I would have paired them together on my Top 10 list). Where Dunkirk showed the events of the military retreat from the fields of battle, Darkest Hour shows the political maneuverings leading to those events back in Great Britain. 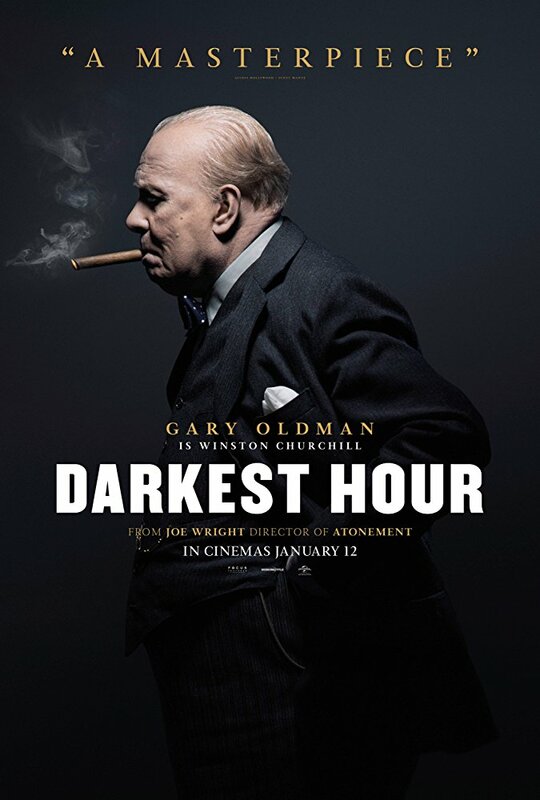 I feel like the story behind Darkest Hour would have made it a wonderful film no matter what, but Gary Oldman's performance as Winston Churchill is what really makes it stand out. Oldman is a great actor, but in most things he's in, you know you're watching Gary Oldman. Here, he completely sinks into the role which naturally leads to some high praise for the film's make up crew. Other good performances are turned in by Ben Mendelsohn (King George VI), Kristin Scott Thomas (Churchill's wife Clemmie), Lily James (Churchill's secretary Elizabeth Layton), and Stephen Dillane (Viscount Halifax). If you're a history buff, a fan of war related period pieces, or just want to see a damn good performance, Darkest Hour will be right up your alley. It has already been in theaters for a few weeks, but with it receiving as much awards attention as it is, there's a good chance that you'll still be able to find it in a theater near you.